Skiing. It’s great. Especially when there’s, say, snow. Or when it’s not, say, hot. But hey, just because it’s summer doesn’t mean you can’t log a few training hours. So here’s how you’ll do that. And where you’ll do that. And maybe go for a little ski-in, ski-out gun practice while you’re at it. You Require: A cushy landing for practicing ski jumps and aerial tricks. You’ll Receive: A set of ramps leading to a sensor-rigged pool that blasts short bursts of air that break the water’s surface tension right before you crash into it. Bonus: getting to backstroke with your skis on. You Require: Some actual skiing. Because that would be nice in July. You’ll Receive: An adults-only summer camp. 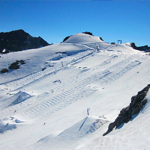 By day, you’ll ski half-pipes and moguls on Whistler’s last glacier. By night, you’ll strictly observe the camp’s “no rules after dark” policy. Their policy-naming guy deserves a raise. An Indoor Ski Track. With Guns. You Require: A never-ending ski tunnel. And maybe somewhere to shoot guns. 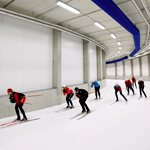 You’ll Receive: A mile-long, indoor cross-country track in Germany. The gradients: up to 12 degrees. The temperature: a constant 24 degrees Fahrenheit. Oh, and there’s a ski-in, ski-out shooting gallery. Because... Germans. You Require: A place to brush up on your bobsledding skills. Yes, that old story. 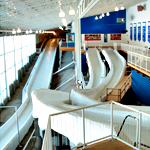 You’ll Receive: The only indoor bobsledding course in the world. Pro tip: you’ll need a coach to use the facility. So hire a coach. Preferably a bobsled coach. You Require: That “wheee” feeling of falling into waist-deep champagne powder. 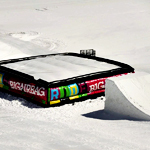 You’ll Receive: A ridiculously giant air bag used by pro skiers to practice their double backflips. It’s shipped to you straight from the Netherlands. You can even customize it with different colors. Maybe go with white.